12 Days of Christmas Competition - Day 9. It's now day 9 of my 12 Days of Christmas Competitions, not many days left to go! Today's prize is a big bundle of Num Noms! The prize includes; x1 Num Noms Deluxe Pack, x1 Num Noms Starter Pack and x2 Num Noms Mystery Pots! Perfect for any little collector out there! In case you haven't heard of them yet but Num Noms took the UK by storm this year and are now one of the leading collectables and rightly so. Uniquely scented, each Num and Nom character is full of surprises. 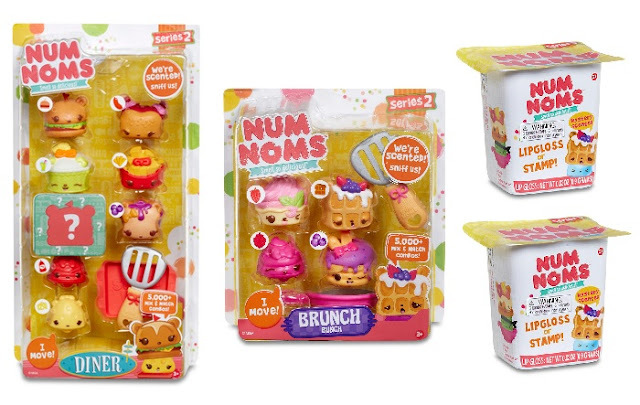 Nums are the outer, soft squishy, hollow characters that nestle on top of Noms, which are either fun scented stamps, motorised, lovely lip glosses or a funky eraser. The diner starter pack sounds lovely! I love the sound of Frenchie Fries! I like the sound of the Jelly Bean ones but also think Marshmallow sounds lovely. My daughter's after these for Xmas, they sound lovely. Oh they're so cute aren't they, my niece loves them. I kind of want the jelly bean set! Cali Roll is stupidly cute. I like the Ice Cream Sundae pack all of them lol! The Cherry Jelly Go Go! Lip Gloss Truck Playset! My niece would love this! The Frenchie Fries - so cute! So many toys to keep up with before Christmas. The mystery pack my LO would probably go for as she usually likes the blind bags and the excitement of finding whats inside! I like the sound of Mac Minty. Pepper Minty Shine, as it's a Christmassy one. The Num Noms Starter Pack as we are just getting started with Num Noms (my daughter collects everything else though). Fab prize ! Really want to win this for my daughter ! Raspberry cream would be my fav the kids would like Frenchie Fry though!